I have received a message from the webmaster at Facebook.com that Betsy Scott Fitzmeyer has sent a message to me on my Facebook "Wall." As you can see by the message, Betsy is a published author who rightly gives credit to her Kuser School and Hamilton teachers for instilling in her the talent and ability to write. Thanks very much for the post, Betsy, it's a privilege having you as both a visitor to this website, and counting me among your friends. Don't know if you have had a chance to check out my website, www.betsyscottfitzmeyer.com. The site profiles my new novel, SEASON of the FLAME. I've had some book signings so far. A cross-section of readers, from teenagers to seniors have apparently found worth in the book, which glorifies God, and the overall theme of which is forgiveness. In any event, Tom, as I conveyed to the current principal of Kuser, I credit a lot of my passion for the written word to my dedicated English and Latin teachers of Hamilton. Thank heavens for HHS '51 classmate Alice Schmidt Mullen! 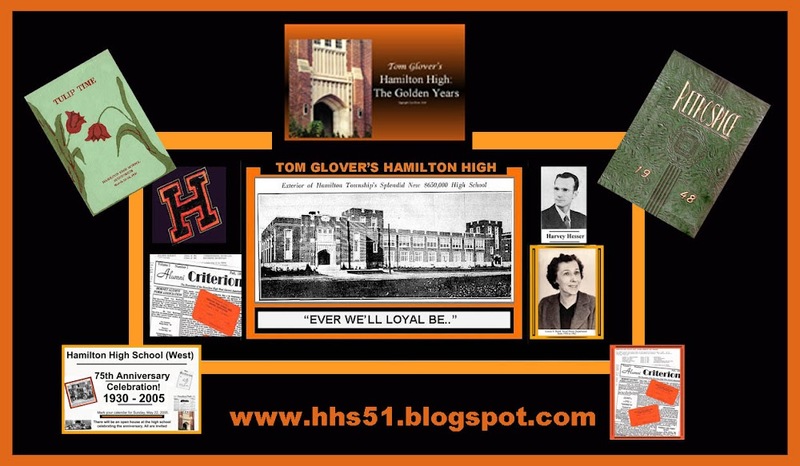 Through all these years, she has diligently kept clippings on any and all events and obits which appeared in the press, and relating to our Hamilton High Class of '51; "The Class With Class." Following are the first of the clippings Alice forwarded to me for publication on my HHS website. Alice, be assured that your efforts are really appreciated; additionally, those of our classmates who are out of the area will really be delighted to be kept up to speed. There are more HHS '51 graphics from Alice; they will be included in future posts. Oh, the stories I could tell about Bill! He was the shining star in the choir at Hamilton High School during my years at HHS. Bill had the voice of an angel, and as you can see by the graphic, he was an accomplished professional singer who could well have been at the N.Y. Met. I first met Bill one evening in 1949 or at a Trenton Giants baseball game at Dunn field. He happened to take the seat next to me. As we got to know each other I found that he would be a classmate when I began my HHS years in 1949. Needless to say, Bill was already a major factor in Louise Baird's choir. Bill, Joe McManimon and Leon Belardino loaned their beautiful tenor voices to many of the Fred Waring choral arrangements we sang. I recall one assembly when Bill sang the beautiful and sacred, "Sanctus." It touched me so deeply, I actually had tears in my eyes and a huge outbreak of "goosebumps." Elsewhere on this website is a column I wrote as a tribute to Bill when I received the devastating news that he had gone on to be with the Lord. He is up there as one of the leading tenors in the heavenly choir. It was a true privilege for me to be able to say I sang with him in our old barbershop quartette back in the 40's and 50's. 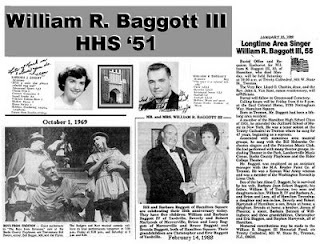 Like Judy and me, Bill also married a classmate from HHS '51, the lovely Barbara Eckert, whom I still hear from on occasion, and whom I know misses one of the area's most beautiful voices. Tony and I went through all 12 years in the Hamilton school system from Kuser School right up the the class of 1951 at Hamilton High. We were close friends during all those years, and I recently met Tony's sister Viola at one of my senior citizen programs. 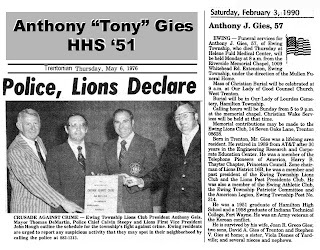 Tony was a gentleman, and is missed. Bob was always ready with the striking smile and personality. 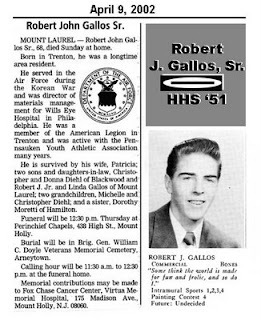 He and classmate Robert A. Gallos usually confused us. Two guys in the same class with the same name was very unusual. As I recall the two were cousins. Bobby, we miss you.